Style & Snow: How long have you been making crochet items? What got you into crocheting? Sarah: I have been crocheting for about 4 years now. I’ve always seen my Mom do it a little, but it was my Gramma (Dad’s Mom) that really taught me how to do it. She taught me in the backseat of the car while we were out thrifting with my Mom around Syracuse! After I learned it took me about a year to really understand, it and now my Mom and I go back and forth sharing patterns and stitches we’ve found. I love crochet because there is no machine in the world that can crochet, it is strictly a handmade art form. Machines can knit and can even knit things that may resemble crochet, but actual crochet can only be done by hand! It’s pretty marvelous! S&S: What are some items you like to create? Sarah: I love to crochet anything. I especially like to try to crochet things I’ve never made before. I crocheted a llama llama doll for my son, totally made the whole thing up but it came out perfect until the dog ate it! I also crocheted a beautiful bralette for a friend. I made up the whole pattern on my own and even made adjustable straps. It came out so wonderful and she loved it! I love making blankets, they take so long–like months and months. But, when they are finished, it feels so rewarding. And people are always just super excited when you give them a blanket, a bundle of warmth and love! S&S: What inspires you to create? Sarah: It’s hard to pinpoint where my inspiration comes from because I’ve always been an artist so I look for inspiration everywhere. I have a BFA specializing in Ceramics and an MFA with a focus on education. After 6 years of art school, I found a home in retail with a company that had a huge focus on visual so I am inspired a lot by fashion. Now, I’m a stay-at-home mom so I find a lot of inspiration online and in the local art community. Most of all I’m inspired by people, who they are and what is important to them. I always go into a project with a person in mind, whether I know them or I make them up in my head. I try to imagine what they would wear with my item or where they would put my item in their home or how the item will fit into their life. I make all my art with love and I love to share it! S&S: What are some activities you like to do besides crocheting? Sarah: Besides crochet, I love doing all the kid things! Playing with the kids takes up most of my day, so I try to make it fun and look for adventure in everything we do. Our family is very outside-oriented so we love to hang out at waterfalls and creeks and the lake. And of course I love shopping. Whenever I get girl time, it’s off to the craft store or the thrift shop! S&S: How would describe your fall…winter style? Sarah: I would describe my fall and winter style as “give me all the layers”. I wear a plaid with just about everything. And, I love jackets, vests, blazers and cardigans! I love mixing prints and patterns. I think my outfits always look a little eclectic but also laid back. I would probably call it girly grunge! S&S: Is there anything else you would like to share with our readers? 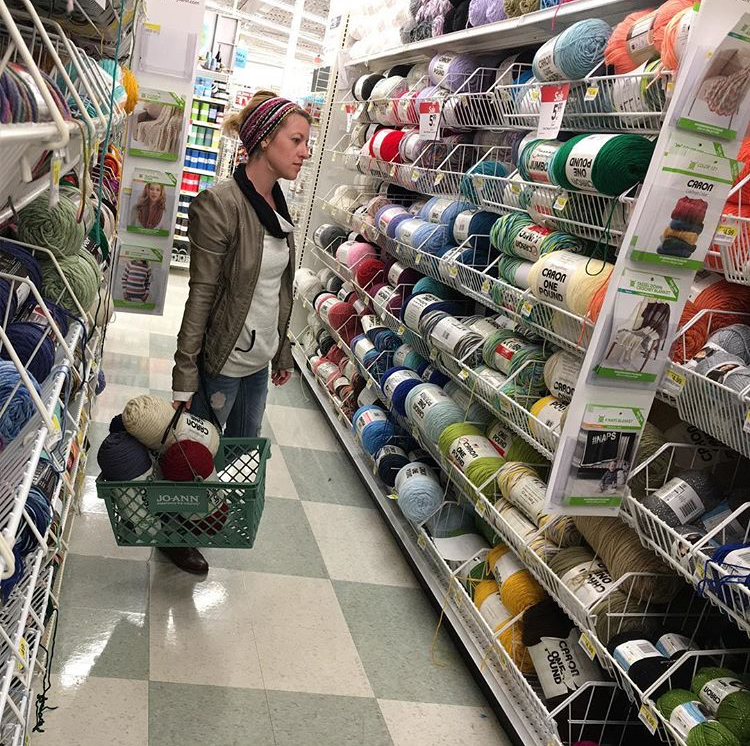 Sarah: I think the one thing I would want people to understand about crochet, or anything handmade for that matter, is that when you buy or get something handmade you’re not just getting that item. You’re getting moments of time that that person used of their life to create something to share. So when I put tags on my items that say “Made With Love”, I mean it. Time is precious, and you don’t get it back. So, to share that with others is a truly special form of love. Thank you for sharing your story with us, Sarah! All pictures courtesy of Sarah. Follow her on Instagram @KnotPlainorTall. Previous Previous post: #AskApril: Are You Really Protective Styling?